On February 2, 2019, about 1700 eastern standard time, a Cessna 150F, N6789F, was substantially damaged during an forced landing near Knotts Island, North Carolina. The commercial pilot was not injured. Day visual meteorological conditions prevailed and no flight plan was filed. The airplane was operated by Aero Feather Aviation Inc., as a personal flight conducted under the provisions of Title 14 Code of Federal Regulations Part 91. The local flight departed from Suffolk Executive Airport (SFQ), Suffolk, Virginia about 1515. According to the pilot, he was performing a post maintenance test flight. Prior to departure, the pilot reviewed the logbooks and conducted a pre-flight inspection. He said that the airplane had about 22 gallons of usable fuel prior to takeoff. After departure, the pilot remained in the airport traffic pattern and conducted several landing approaches. The pilot departed the traffic pattern and flew 10 miles to the south where he conducted flight maneuvers. After about 30 minutes of flight maneuvers, he turned towards the east and headed to the Outer Banks Barrier Islands. While enroute the pilot stated that he experienced a "electrical shutter (instruments turning off and on)." He made a turn back toward SFQ and shortly after the electrical system failed followed by the engine. The pilot attempted to restart the engine and but was unsuccessful. 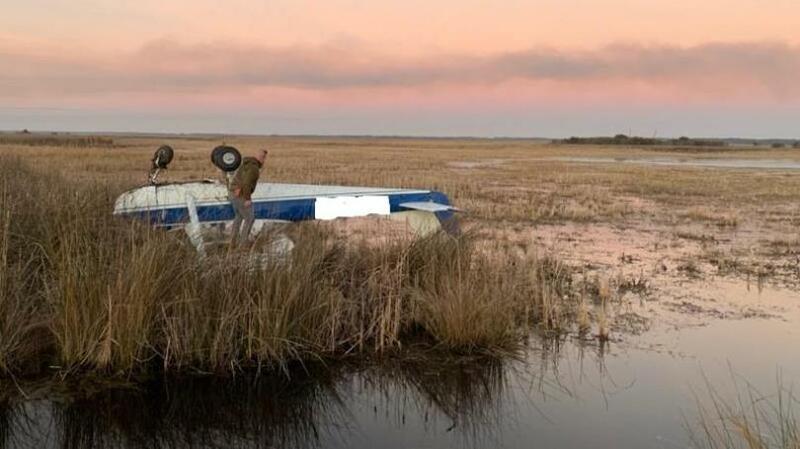 He radioed "MAYDAY" and made a forced landing in a marsh. The pilot exited the airplane and contacted the local authorities. According to the operator, the pilot was advised to remain in the traffic pattern of the local airport, considering how much maintenance was recently performed. The mechanic that performed the maintenance watched as the pilot performed 30 minutes of engine runs, taxiing and operational tests on the ground prior to the test flight. A examination of the airplane by a Federal Aviation Administration (FAA) inspector revealed that the airplane was inverted with the nose landing gear partially detached from the engine mount. The airplane was recovered and flight control continuity was established. A cursory examination of the engine which included cylinder compression, spark plug removal and analysis, valve train continuity checks, magneto spark, and carburetor inspection did not reveal any anomalies that would have prevented normal operation. About one cup of uncontaminated fuel was drained from the fuel system and the fuel selector was found in the open position. Both fuel caps were inspected and the fuel cap gaskets were intact. Both wing fuel tanks were empty of fuel and there were no signs of fuel leakage. Operator: Aero Feather Aviation Inc.
CURRITUCK COUNTY, North Carolina (WITN) - A pilot is safe after a small private plane crashed on Knotts Island in Currituck County, according to Currituck County Fire-EMS. Crews with the Currituck County Fire-EMS as well as Knotts Island volunteers responded to the crash around 5:11 p.m. Saturday along the 200 block of Island Bay Lane, Chief Ralph Melton said. Once on scene, first responders found a small private plane still intact, but upside-down in the marsh off of Knight's Point, Melton said. The pilot of the Cessna aircraft was not injured and was already out of the plane once crews arrived. Crews used a ladder to help bring him back onto dry land. The plane took off from the Suffolk Executive Airport in Suffolk, Virginia and experienced mechanical trouble while flying near the island, Melton said. The crash is under investigation by the North Carolina State Highway Patrol and the National Transportation Safety Board.